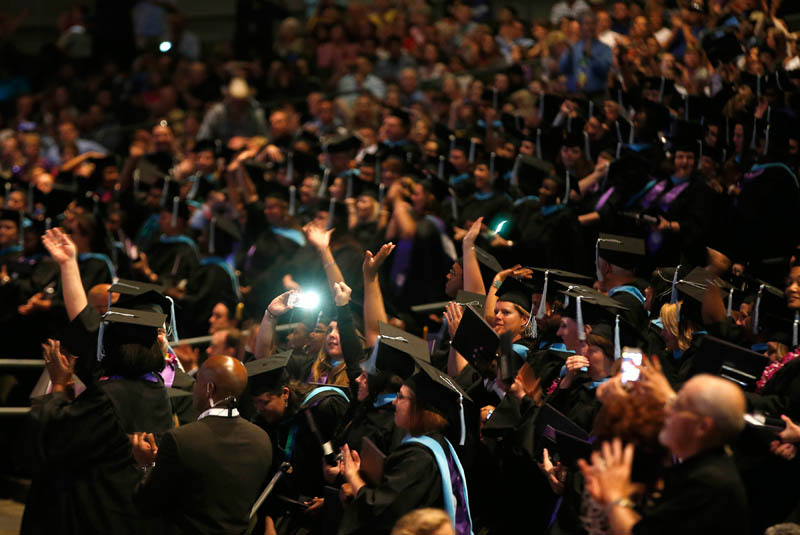 Day 2 of Grand Canyon University’s online commencement Saturday was filled with people – nearly a full house in the morning, packed in the afternoon – and also with emotion. But for Geraldine Sam, the feelings bubbled over as soon as she walked into the staging area at Comerica Theatre. Even before the regalia staff could help her arrange her mortarboard, Sam broke down in tears and sobbed on a worker’s shoulder. The first-grade teacher wasn’t speaking solely about her master’s degree in educational administration. In 2009, Sam was sworn in as mayor of La Marque, Texas, a town of almost 15,000 about 35 miles southeast of Houston. She thus became the first female African-American mayor in Galveston County, serving in that role for two years. But the family’s trailblazing doesn’t stop there. Geraldine’s nephew is Michael Sam, the University of Missouri athlete who recently became the first prominent football player to announce during his career that he is gay. Michael made his declaration even though there was speculation that it could hurt his chances of being a top pick in the National Football League draft in May. Geraldine Sam comes from a history-making family, yet her focus Saturday was on praising GCU. 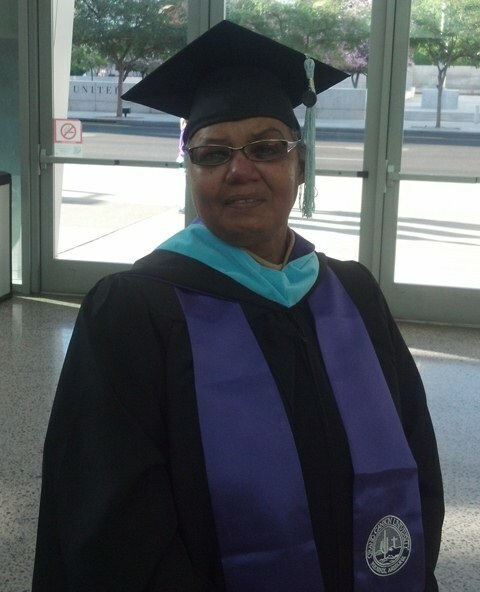 Geraldine, or Aunt Gerrie as Michael knows her, has been teaching for 29 years since getting her bachelor’s degree from Prairie View A&M University, and she doesn’t intend to stop at a master’s. She said she will begin working on her doctorate from GCU in a couple of months, and if the University ever needs someone for a promotional video, she’d be a great candidate. She said she has talked several friends into becoming GCU online students. Sam’s enthusiasm was matched, and then some, by Gloria Billings, a second-grade teacher from Fayetteville, N.C., who also got her master’s, in elementary education. Billings didn’t break down in tears. Instead, she wanted to shout her love of GCU from the rooftops. Her good feelings started with her enrollment counselor, who kept calling her until she agreed to give the program a try — and then stayed in touch long after she started. 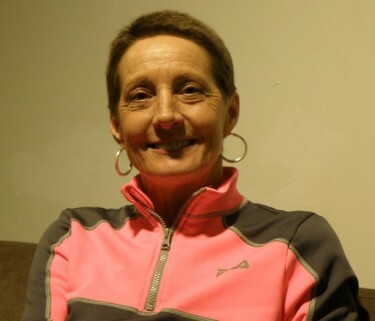 Billings said she needed the support because both of her parents have been ill, and she credits her husband, Bruce, for supporting her, along with her four children. She has two grandchildren and another one on the way. Billings, like Sam, has been a GCU recruiter on the side. She has talked two friends into doing the online program. Faculty, staff and grads were raving about the quality commencement address by Karen Mills, who now makes her living as a comedian based in Chattanooga, Tenn., where she played basketball while attending the University of Tennessee at Chattanooga. She graduated from the school in 1981. Mills seamlessly weaved life lessons, anecdotes and jokes into her address, and she customized her four speeches over two days with remarks specific to each of GCU’s colleges. She also produced the PowerPoint, set to Gloria Estefan‘s song “Reach,” that closed her talk, and her impressive attention to detail included a purple blouse. Commencement speaker Karen Mills, taking a breather between sessions on Saturday. As she relaxed backstage between Saturday’s sessions, Mills said she felt “a bit of relief knowing that this was an older group (of graduates),” and her conversational-style message, delivered with a Southern accent, hit the perfect tone. This was her first commencement address, and she said she would like to do more of them. The graduates could relate to that later-in-life career of hers. Mills began in comedy at 34, performing at open-mic nights at the Punch Line comedy club in Atlanta, the city where she lived for 18 years. Encouraged by the club’s owner, she began writing her own material, and now she is on the road for at least parts of three weeks each month, often touring with the Southern Fried Chicks revue. Mills said she regularly hears from cancer survivors who appreciate her candor and find healing in her humor. Terri Fuller threw herself into volunteer mode when she saw the need. Some nursing graduates might have wondered why a friendly woman in full cap and gown was waving her arms just inside the door and telling them where to go to prepare for the afternoon ceremony. Meet Terri Fuller, who does colonoscopies at Banner Thunderbird Medical Center in Glendale and looks as if she could make even that procedure, well, at least entertaining. “I thought to myself, ‘You’re just standing there, Terri. Might as well do something,’” Fuller said. So when Fuller noticed that the steady stream of grads was becoming too much for one person to handle, she jumped right in. She said she’d like to teach preventative or alternative medicine at GCU, and Saturday she showed that she certainly can teach leadership. Dr. Kimberly LaPrade, dean of the College of Education, referred to the “COE Promise” during her brief remarks to the graduates Saturday morning. Some may have wondered: What exactly is that? The college promises to help any graduate with any teaching-related issue for their first year after leaving the GCU program. Dave Smith, director of academic excellence for COE, said it’s a practice that dates to 1984 at GCU, was suspended for several years in the middle of the last decade and then reinstated four years ago. He doesn’t know of another university that does it. Brian Engel of the Comerica staff, possibly the hardest-working guy in the commencement business this past week. GCU relied on Robert Healy and Brian Engel of the Comerica Theatre staff to make everything work for the staging of commencement. The theatre did an Arizona State University commencement in February and will do one for Rio Salado College in May, Engel said. Logistics involved a dizzying array of aspects: video, audio, lighting, draping and layout, to name the most significant. Engel oversaw much of it, in his role as operations manager and technical director. Healy, the facility’s maintenance engineer, made certain that the lobby was set up to accommodate the crowds, which on Saturday included 604 graduates in the morning for the College of Education and 771 in the afternoon for the College of Nursing and Health Care Professions. With friends and family also in the house, the upper level was nearly full Saturday at the 5,000-seat theatre, comparable in size to GCU Arena. It had been relatively unoccupied on Friday’s first day. ‘Lopes Up! Becky Barber, GCU’s social media specialist, draws the outline of an antelope head on the graffiti wall connecting Comerica Theatre with its dressing rooms. Both men praised Jennifer Girl, GCU’s director of campus events, for her organizational skills. Girl said Engel even built a staircase that ended up not being used after a more suitable one was found. Catherine Rodriguez, of Shirley, N.Y., and Angela Maxwell, of Atlanta, couldn’t stop talking and smiling as they prepared to receive their bachelor’s degrees in elementary education and special education, respectively. Like many online students, they began their friendship by phone when they were in the same online class – in their case, in 2012 – and have been talking at least once a week ever since. They met for the first time Thursday and saw the GCU campus for the first time Friday. Rodriguez also was excited about meeting Ashley Conover, an enrollment manager for COE who, Rodriguez said, called her less than 30 minutes after she originally inquired about the program and then stayed in touch during her time in the program. “She helped me with whatever question I had. She was really good,” Rodriguez said. Another twist to the friends-studying-together routine: Bexy Thomas and Jolly George once were neighbors in West Palm Beach, Fla., and stayed in touch after Thomas had to move to Dallas because of her husband’s job. They went through the nursing program together, Thomas to get her master’s and George her bachelor’s, while visiting each other every few months. Graduating on the same day was the perfect capper. “We’re like mom and daughter,” Thomas said. These decidedly unsensible shoes belong to Patrece Hallock, who admits they don’t work for the on-your-feet job of nursing. Call us crazy — and plenty have done so — but we started wondering about all the nursing graduates in their high-heel shoes. If ever there were a career made for sensible shoes, it’s nursing. And high heels are not sensible. At least, not to a couple of men wearing Rockports. We were drawn to the hot-pink heels of Patrece Hallock, who works in labor and delivery for St. John Medical Center near Vancouver, Wash., and was on hand to claim her BSN. “I like to wear heels, but I can’t on the job,” said Hallock, 30, who is originally from Goodyear. Malychanh Williams, who lives in Sacramento, Calif., and works at Folsom State Prison, towered over most of the other graduates in her heels, which transformed her from 5-foot-10 to about 6-2 as she got her master’s. Colleen Boman, a nurse practitioner from The Woodlands, Texas, who was getting her bachelor’s, is almost as tall (5-8) as Williams but said she wears monster heels every chance she gets. She had no difficulty moving around. OK, Colleen, we’ll take your word for it. But your shoes are making our feet hurt. Wow, what a great day and well put together event. The ceremony was superior with a great speaker and staff of GCU. Everything was wonderful for my big day. Thanks to the GCU staff for all the help of getting prepare for the big moment. Also, I love all the write-ups and comments from my new family. Thanks and God Bless to All!